Some people are just great story tellers. In writing. This isn’t out yet, I got my copy through NetGalley and as I tend to request more titles than I can possibly read, since I cannot tell from the blurbs how much am I going to like them. And now I have so many titles, I came up with a solution on which to read. So, to get back to Cursed. I wanted to include the blurb but after reading it, I decided against it. It is also the reason why I didn’t think this book might actually be that interesting. I’m glad I was proven wrong about that. 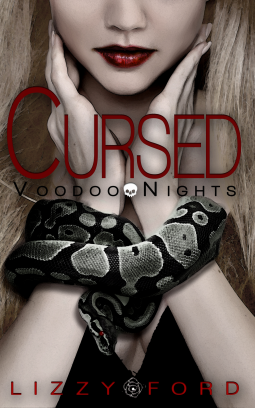 As you can tell from the series title, there is a lot of Voodoo in this book. I’m sure there are people out there who would believe the reality of voodoo stuff happening in this novel, but I’ll call it paranormal YA novel. There is a hundreds years old curse still being played out in present day, concerning tree of the four main voodoo families living in New Orleans. Jayden, is actually a descendant of two of those families and doesn’t believe in those superstitions. On the other hand, Adrienne does, as her family is the bearer of the curse which kills the firstborn of every generation, supposedly ending with Adrienne’s sister Theresa. And this is where it all gets complicated. In a wonderfully good way. Adrienne gets into Jayden’s rich boy world and school on a scholarship. And New Orleans is where all this takes place – the post-Katrina NO which is not a lovely, nice place, especially where Adrianne lives with her father. I was apprehensive this book might end with a cliffhanger but it didn’t. Or not as much as you would fear. I mean, it’s obvious there are going to be sequels (soon I hope!) so the story will have to continue, but for my personal reading peace, my questions were answered and I don’t feel the need to pull my hair out before the next installment is out.